TFP: Three Episodes or Four? 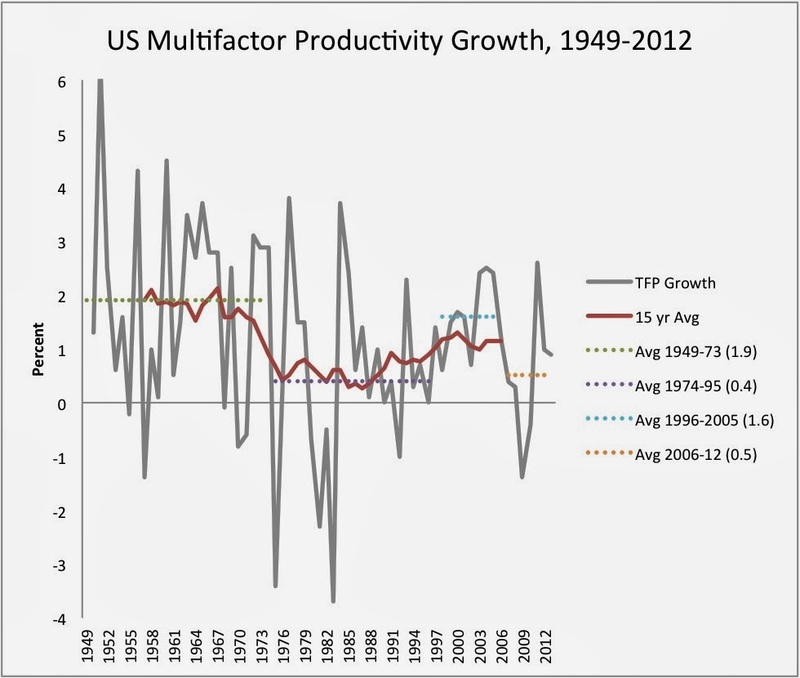 That shows total factor productivity growth (TFP, though some call it "multifactor") which is a measure of technological progress calculated as a residual: the part of output growth that cannot be explained by increases in factors of production (capital and labor). Another way to think of it is that it is the growth that would occur even if the amount of machinery and equipment as well as labor stayed the same. The CEA's report explains it quite nicely starting on p. 181. Technological progress is the key determinant of long run living standards, so if the trend of technological progress has risen after its slump in the 1970's and 80's, its a big deal (and a bigger deal than many of the short-run cyclical issues we tend to obsess over). 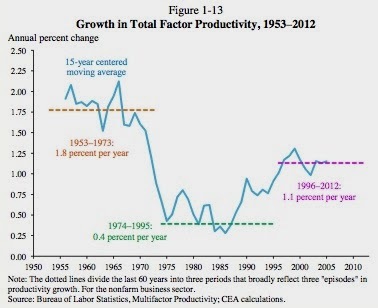 That is, productivity growth has risen about halfway back to its "postwar golden age" level since the mid-1990's. While identifying breaks in a series like this can be tricky, there does seem to be consensus that there was a slowdown in the mid-1970's and a resurgence in the mid-1990's. However, the results are somewhat different than what I presented to my macroeconomics students a few weeks ago. This is a chart made from the BLS' Historical Multifactor Productivity Measures for the private non-farm business sector (which I believe is the same data the CEA used). The gray line is the actual annual growth (you can see why it helps to average out some of the volatility) and the red line is the centered 15-year average (i.e., the same as the CEA's graph). However, the CEA's method of averaging means that their graph stops in 2005. The years since then have not been good ones for TFP. Since their data point for 2005 is an average over the years 1998-2012, the CEA is not ignoring the bad news, but they are lumping it in together with some good years (the late 1990's and early 2000's). This would be consistent with a brief 'boom', perhaps attributable to information technology and the internet, in 1996-2005, but one that is already exhausted. That is the view that Robert Gordon took in this NBER working paper (and recent update). Identification of trends in short periods of volatile data is inherently uncertain, and it may be sensible to think the reduction in TFP growth over the past several years is largely the artifact of cyclical factors. That seems to be, implicitly, the CEA's view (and Ben Bernanke also has argued for a more optimistic interpretation of long-run prospects). Whether they're right or Gordon is will make a huge difference for standards of living a generation or two hence, but, just now, it is too soon to tell. A mildly encouraging employment report from the BLS today: in February, payrolls increased by 175,000. The unemployment rate ticked up to 6.7% (from 6.6%), but that was partly due to a slight increase in labor force participation. The payroll number comes from a survey of firms and the unemployment rate from a survey of households (which has a smaller sample size); in the household survey, the number of employed people only grew by 40,000, while the labor force grew by 264,000. Since the surveys are separate, they do not match up every month - last month the number of people reporting they were employed in the household survey was much stronger than the increase in payrolls. 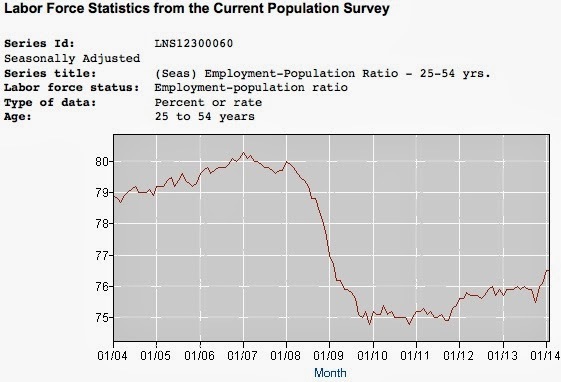 This shows some recovery, but still a pretty deep hole relative to where we were before the recession. 'U-6', the broader measure of the unemployment rate which includes discouraged workers (i.e., people who are not looking for work but say they would like to have a job) and people working part-time but who would prefer to be full-time is at 12.6%, down from 14.3% a year ago. 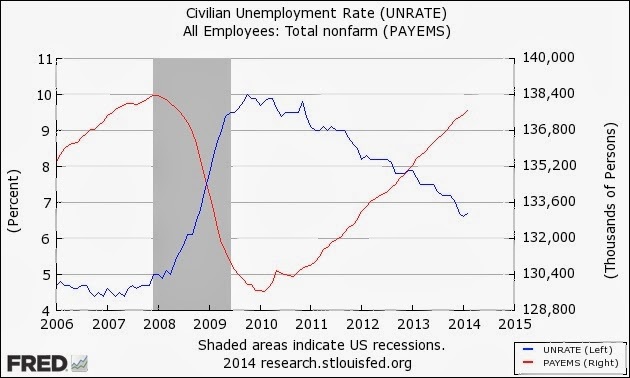 10.5 million people are unemployed, and 3.8 million of them have been unemployed for longer than 27 weeks. The data are all seasonally adjusted; on a non-seasonally adjusted basis the unemployment rate was 7.0% and payrolls increased by 750,000 (i.e., unemployment in February is normally high, so the seasonal adjustment is down, but payrolls normally grow, so the growth of payrolls is also adjusted down to remove the 'seasonal' effect).